This certification mark is awarded to an eCall simulator. eCall is an initiative of the European Union for the implementation of a pan European emergency system for all passenger vehicles. An eCall equipped car, in case of a crash, automatically calls the nearest emergency centre. CEN and ETSI have defined standards for automated or manual emergency calls enriching the existing European harmonized number 112 for emergency services with complementary signalling. Prior to the voice communication between passenger and rescue coordination centre (= PSAP: Public Safety Answering Point) the IVS (in vehicle system) will send data the so called Minimum Set of Data (MSD) to the PSAP. The content of the MSD is defined in the CEN EN 15722 „Road transport and traffic telematics — ESafety — ECall minimum set of data”. The protocol for the data transmission is specified in the CEN EN 16062 „Intelligent transport systems — eSafety — eCall high level application requirements [(HLAP]) (using GSM/UMTS circuit switched networks)”. To validate the conformity of the implementation there is the CEN EN 16454 „Intelligent transport systems — ESafety — ECall end to end conformance testing“. This standard describes test cases for the validation of IVS and PSAP. The eCall simulator implements all applicable test cases und can simulate a PSAP or IVS respectively. This certification mark is awarded within the scope of voluntary certification based on test criteria derived of the above mentioned applicable eCall standards. The continuous adaptation of the eCall simulator to revised standards and the procedures for quality control of the software development process are part of the review process in an audit. Conformity to EN 16454 is validated with an application test and an audit. Within the application test, it is validated if all test cases are implemented according to the standard. It is verified in an audit, if the development process follows well defined rules and procedures, to ensure that new versions of the simulator due to the improvement of standards or functional modifications do not influence the quality of the simulator. 2. Usable as a simulator for PSAP:The suitability as eCall simulator is validated with an application test. By this, it is verified if the simulator can be used as IVS to test a PSAP and if the respective test cases of the standard are applied in the correct way. It will be tested if the simulator can be configured for different test scenarios on the basis of the HLAP-parameters and if such test runs are logged correctly. In addition, the stability of the simulator will be validated receiving incorrect MSDs, as well as the system stability is validated by processing erroneous MSD. 3. Usable as a simulator for IVS:The suitability as eCall simulator is validated with an application test. 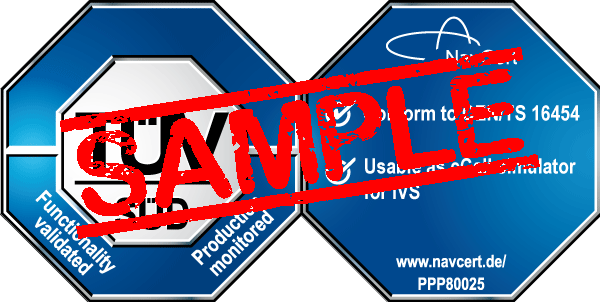 By this, it is verified if the simulator can be used as PSAP to test an IVS and if the respective test cases of the standard are applied in the correct way. It will be tested if the simulator can be configured for different test scenarios on the basis of the HLAP-parameters and if such test runs are logged correctly. In addition, the stability of the simulator will be validated receiving incorrect MSDs, as well as the system stability is validated by processing erroneous MSD. The suitability as eCall simulator is validated by an application test. By this, it is verified if the simulator can be used as IVS and PSAP and if the respective test cases of the standard are applied in the correct way. It will be tested if the simulator can be configured for different test scenarios on the basis of the HLAP-parameters and if such test runs are logged correctly. In addition, the stability of the simulator will be validated receiving incorrect MSDs, as well as the system stability is validated by processing erroneous MSD. The functionality of the eCall simulator is tested. It is verified that all functions of the system work as advertised and produce the expected result.